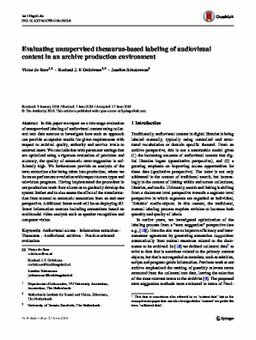 In this paper we report on a two-stage evaluation of unsupervised labeling of audiovisual content using collateral text data sources to investigate how such an approach can provide acceptable results for given requirements with respect to archival quality, authority and service levels to external users. We conclude that with parameter settings that are optimized using a rigorous evaluation of precision and accuracy, the quality of automatic term-suggestion is sufficiently high. We furthermore provide an analysis of the term extraction after being taken into production, where we focus on performance variation with respect to term types and television programs. Having implemented the procedure in our production work-flow allows us to gradually develop the system further and to also assess the effect of the transformation from manual to automatic annotation from an end-user perspective. Additional future work will be on deploying different information sources including annotations based on multimodal video analysis such as speaker recognition and computer vision.